Diane Goeres-Gardner is a fifth-generation Oregonian, with roots in Tillamook County as early as 1852. She has a master’s degree from the University of Oregon where she studied with poet Ralph Salisbury. 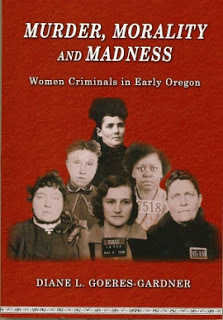 Her book Necktie Parties: A History of Legal Executions in Oregon, 1851-1905, was released by Caxton Press in 2005 and her Murder, Morality and Madness: Women Criminals in Early Oregon appeared in 2009, also by Caxton. Her book Images of America: Roseburg was published by Arcadia Press in 2010, part of its Images of America series. In addition to writing about Oregon history, Goeres-Gardner is a poet, winning the 2002 narrative division in the Oregon State Poetry Contest with “Racing the Antelope.” and she has been a sponsored speaker for the Oregon Council for the Humanities. She and her husband live along the Umpqua River surrounded by Myrtlewood trees and her miniature poodle-mix Cody. Inside Oregon State Hospital: A History of Tragedy and Triumph from The History Press along with Images of America: Oregon Asylum due to be released by Arcadia Publishing this summer. EB: How did you get interested in crime? DG-G: I got interested in Oregon’s hangings after noticing stories in old Oregon newspapers. I had been reading microfilm newspapers from the 1850s in the University of Oregon Knight Library. After collecting a few I became curious and tried to find out how many had occurred. I discovered that except for a few wonderful county historians, no one knew how many men had been executed or where the executions had taken place. This was right after William Longs’ book about Oregon’s history of capital punishment “A Tortured History” had been published. He had about a page and a half dedicated to the years prior to 1905. To me it seemed a fascinating subject and one that would make a wonderful book. 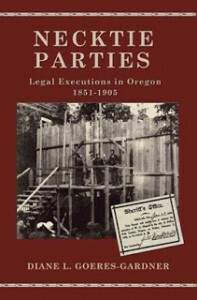 After several years of research I submitted the manuscript to Caxton Press and they published my book Necktie Parties: A History of Legal Executions in Oregon, 1851-1905 in 2005. EB: In frontier Oregon, what could get you hanged? DG-G: Oregon has only hanged men after they were convicted of first-degree murder. I couldn’t even find a lynching for anything other than murder. There are a lot of myths floating around about who was hanged first and that so-and-so was hanged for stealing a horse. Almost all the myths I encountered were false. EB: Hangings were social events. Why is that? Is there an American desire for spectacle, like reality shows, or did hangings fill some other social function? DG-G: The major reason they were social events was to prove to the citizens that law and order really worked and the legal punishment was carried out. They served as a social function for people to get together, meet their neighbors, lecture children about morality, and do a little shopping in town. All the hangings took place in the county seats. EB: You have also written about women being incarcerated. What were some of the reasons that women were imprisoned in early Oregon? DG-G: Women were incarcerated for the same crimes men were. The major difference was that there wasn’t any place appropriate to put them when they were convicted of crimes. The Oregon State Penitentiary was never designed to hold women – under the assumption women would not commit crimes – and very few did. The first Oregon prison for women was opened in 1965. EB: Were there typical women’s crimes? DG-G: Oregon has never executed a woman. And no woman was convicted of first-degree murder until the law was changed to allow judges and juries the option of execution or life in prison for a first-degree murder conviction. Mostly women were sent to prison for short periods of time for first-degree larceny. EB: How has this informed your views on women’s rights? DG-G: Murder, Morality and Madness: Women Criminals In Early Oregon is a case-by-case study that illustrates how women accused of crimes were unfairly treated by the court system, their neighbors, and society prior to 1900. That didn’t change much until they received the right to vote in 1912 and even then the cultural obstacles took much longer to overcome. Even now in 2013, there are still people in the government trying to limit women’s rights. It’s extremely disappointing. Read history and discover the truth. EB: Your books contain a lot of research. Have you always been a writer/researcher? DG-G: I think of myself more as a researcher than a writer. I write to get my research into print. The research is fun. Writing is really hard work! My goal has always been to recreate the cultural and psychological context experienced by the participants in the historical events I’m writing about. I want the reader not only to understand the history but to empathize with the individuals involved. EB: Tell us about your latest project. DG-G: I became interested in the history of the Oregon State Hospital (known as the Oregon State Insane Asylum until 1913) because many of the women prisoners were sent to OSH in a humanitarian effort to provide appropriate housing for them. It became an even higher priority for me when the hospital began its reconstruction efforts in 2006 and they started planning to demolish many of the historic buildings. I have two new books being released this summer. 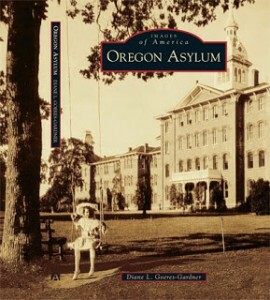 The first is Images of America: Oregon Asylum due to be released by Arcadia Publishing on June 17. It is a photo-history showing the 120-year history of the Oregon State Hospital using photos, graphs, and other historical materials. My daughter, Laurie Burke, took many of the later photos. My second book is “Inside Oregon State Hospital: A History of Tragedy and Triumph published by The History Press. It includes a foreword by John Terry, an Oregonian columnist. It will be released about the end of June. It is an 85,000-word narrative looking at the hospital’s history through the eyes of the patients who lived there. It also tracks the various changes in mental health care from 1860 to 2012 in Oregon and the United States. I believe very few Oregonians know about the Eugenics Movement in Oregon when hundreds of people were sterilized (men were castrated) because they were poor, mentally ill, gay, or promiscuous. The whole movement led to the Holocaust in Germany. Authorities in Oregon were avid supporters of the movement. Included are interviews with Dr. Dean Brooks, superintendent of OSH when “One Flew Over the Cuckoo’s Nest,” was filmed in the old J Building, the new superintendent, Greg Roberts, and various other hospital employees. If you ever wondered about the mental health system in Oregon or saw the old buildings in Salem, this book is the only published history of the hospital. It includes a full index and over a thousand endnotes as references, and is supported by the Oregon State Hospital Museum of Mental Health, which opened in October 2012. For future announcements concerning Inside Oregon State Hospital: A History of Tragedy and Triumph, please check my web page “www.dlgoeres-gardner.com”. EB: Thanks. I hope we can get you back in the summer to talk more about these new books.